Iranians attend a ceremony celebrating the 40th anniversary of the Islamic Revolution, at the Azadi Freedom Square, in Tehran, Iran, on Feb. 11, 2019. 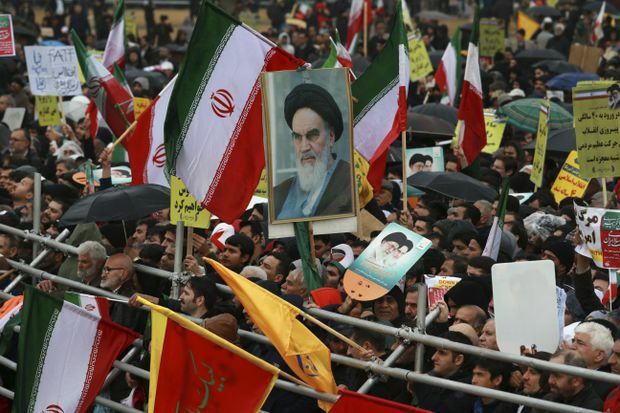 In Tehran, crowds streamed in the rain from a dozen of the capital’s far-flung neighbourhoods to mass in central Tehran Azadi, or Freedom Square, on Monday, waving Iranian flags and chanting “Death to America” – a chant that has been standard fare at anti-U.S. rallies across Iran. This year’s anniversary comes as tensions rise with the United States and Iran grapples with the aftermath of President Donald Trump’s pullout last May from the 2015 nuclear deal between Iran and world powers and tough U.S. economic sanctions, reimposed in November. In the backdrop to Monday’s marches, the military displayed Iranian-made missiles, which authorities showcase every year during anniversary celebrations and which now have a range of up to 2,000 kilometres (1,250 miles) and are able to Israel and U.S. military bases in the region. Rouhani also promised the crowds that Iran would overcome the economic hardship amid the country’s spiralling economy and the newly imposed U.S. sanctions.